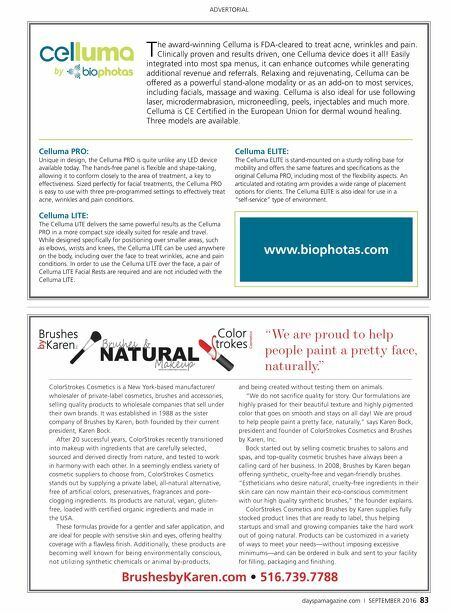 ADVERTORIAL 82 DAYSPA | SEPTEMBER 2016 Our storybook tale began over 90 years ago with a family-owned business in the South of France. Today, BelleCôte Laboratories continue to explore ingredients from naturally occurring compounds found in marine plants, and to generate and harvest natural ingredients from volcanic layers of the Pacific Ocean. BelleCôte offers an expert line of skin care like no other, providing scientifically advanced treatments, back bar and retail products. Natural ingredients, such as deep sea minerals, peptides, antioxidants and bioactive marine ingredients from rare algae, preserved in their original form, deliver ultra effective healing properties. Unleash the power of Triple Active Collagen, phytonutrients and marine origin Botoxal, with our Triple Collagen with Botoxal that naturally recharges and restores the skin. This outstanding natural treatment is an excellent source of protein that brings elasticity and a lifting, Botox-like effect to the skin. With the additional infusion of reparative antioxidants, organic seaweed extracts and hyaluronic acid, the treatment is like no other. Build up and refresh cells with our Sensitive Treatment with Stem Cells. Stem cells have a tremendous ability to rejuvenate and revitalize aging skin and replace damaged cells. Bilberry extract helps treat damaged skin affected by fragile capillaries and rosacea. This treatment also bestows a calming and anti-inflammatory effect. Our Caviar Radiance Treatment is a runaway hit, loaded with potent caviar extract providing unparalleled nourishment and mineralization. Skin will feel full and plump and leave behind a beautiful glow. Our Wrinkle Erasing Serum with Botoxal is also a top seller! Our retail products and professional treatments are designed to work in synergy. From coast to coast, customers are reaping the benefits of BelleCôte — the beautiful coast. "BelleCôte means beautiful coast. 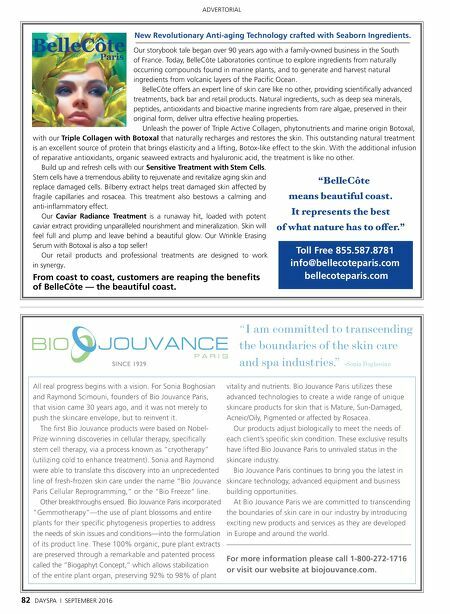 It represents the best RIZKDWQDWXUHKDVWRRɲHUµ Toll Free 855.587.8781 info@bellecoteparis.com bellecoteparis.com New Revolutionary Anti-aging Technology crafted with Seaborn Ingredients. All real progress begins with a vision. For Sonia Boghosian and Raymond Scimouni, founders of Bio Jouvance Paris, that vision came 30 years ago, and it was not merely to push the skincare envelope, but to reinvent it. The first Bio Jouvance products were based on Nobel- Prize winning discoveries in cellular therapy, specifically stem cell therapy, via a process known as "cryotherapy" (utilizing cold to enhance treatment). Sonia and Raymond were able to translate this discovery into an unprecedented line of fresh-frozen skin care under the name "Bio Jouvance Paris Cellular Reprogramming," or the "Bio Freeze" line. Other breakthroughs ensued. Bio Jouvance Paris incorporated "Gemmotherapy"—the use of plant blossoms and entire plants for their specific phytogenesis properties to address the needs of skin issues and conditions—into the formulation of its product line. These 100% organic, pure plant extracts are preserved through a remarkable and patented process called the "Biogaphyt Concept," which allows stabilization of the entire plant organ, preserving 92% to 98% of plant For more information please call 1-800-272-1716 or visit our website at biojouvance.com. "I am committed to transcending the boundaries of the skin care and spa industries." -Sonia Boghosian vitality and nutrients. Bio Jouvance Paris utilizes these advanced technologies to create a wide range of unique skincare products for skin that is Mature, Sun-Damaged, Acneic/Oily, Pigmented or affected by Rosacea. Our products adjust biologically to meet the needs of each client's specific skin condition. These exclusive results have lifted Bio Jouvance Paris to unrivaled status in the skincare industry. Bio Jouvance Paris continues to bring you the latest in skincare technology, advanced equipment and business building opportunities. At Bio Jouvance Paris we are committed to transcending the boundaries of skin care in our industry by introducing exciting new products and services as they are developed in Europe and around the world.